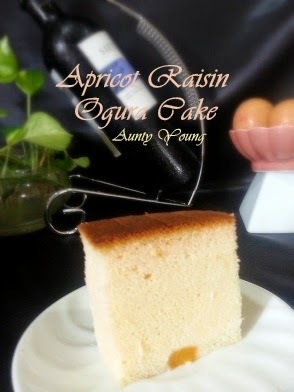 To use up the remaining apricots at home, today's Ogura cake came in this sweet and sour "Apricot Raisin" flavor. Luckly, the texture was once again moist and soft. 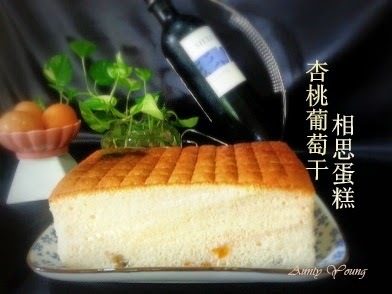 As usual, I refrigerated the Ogura cake before eating it. Love that cold and spongy texture! 1. Beat the egg york,whole egg,salt,corn oil,apricot juice until fluffy. 3. Pour the mixture(B2) into the 7"square base removable pan, add in the diced apricot and raisin that are coated with flour, try to get rid of the air by lightly tapping the pan. Even though I coated the raisins and apricot with cake flour, they still sank to the bottom of the batter. Fellows, any suggestions? This combination looks unique, am sure the taste is unique too. That is a nice flavor, Aunty Young! 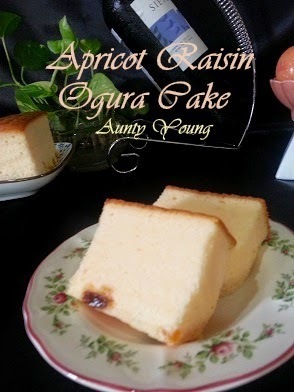 Ogura Cake is always welcomed anytime. I love it a lot! 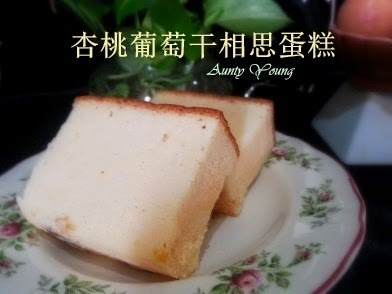 Hi Aunty Young, another lovely cake with a unique flavour. 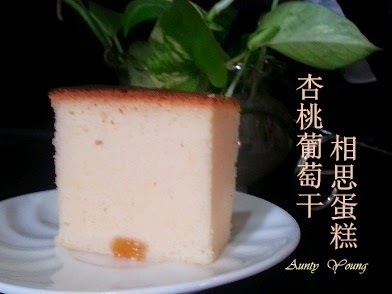 I like this cake cos' it can keep well for at least 2 weeks when chilled. Good recipe. 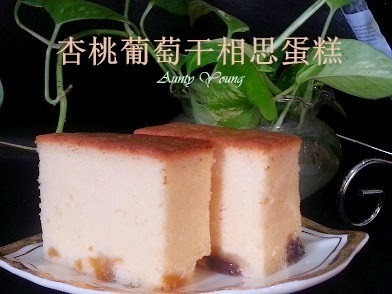 I also using the same method to prevent the fruits sink, so cant really advise you the correct method, sorry..remind me I have so long did not attempt this ogura cake again..